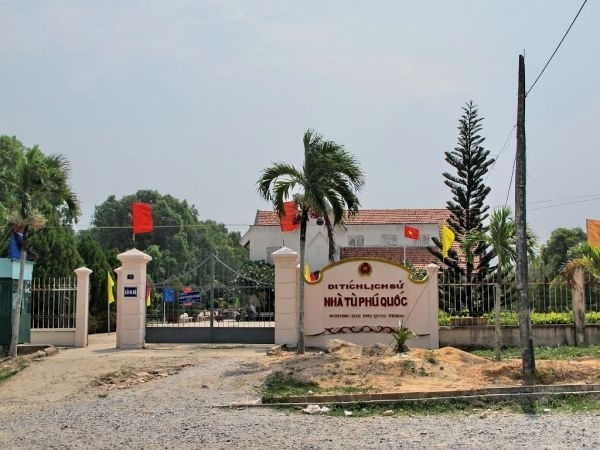 Cay Dua Prison in An Thoi town has an erea of 40 ha divided into four sections A, B, C and D to detain prisoners and anti-French people. In 1956, the Saigon administration repaired and renamed it as "Cay Dua Amendment" to imprison the Communists prisoners. This place is deeply impressed by glorious feats of prisoners in confinement period. The prison was divided into 12 wards, but only 11 of them had been used then the Paris Agreement was signed, and the prison has not operated any more. Here, visitors will withness preserved vestiges of war. Cay Dua Prison was declared as a historical vestige by the Ministry of Culture and Information in 1996; and it has now been repaired into a tourist spot. The story is that, Phu Quoc residents, very long time ago, chiefly lived on fishing. They frequently faced danger in life due to raging sea waves, even the disappearance of many boats and junks. One day, there appeared a large rock by the while fine sand bank under the sapphire water surface, which was thought to be a miraculous omen by the islanders. 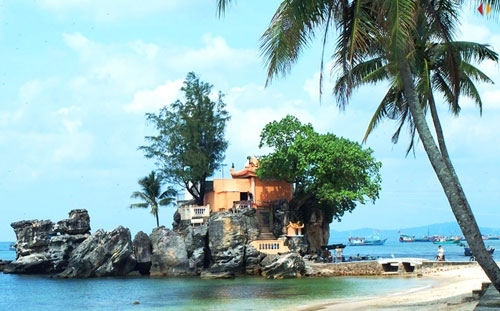 The Duong Dong fishermen built a temple on the sand dune to worship the Water Deity to entreat protection whenever going out to the sea. Since then "Cau" (uncle) has been regarded as a powerful deity for safety of boats in fierce storms. prior to each voyage, islanders often come here to burn incense to entreat safe and sound return. Originated from such quiet worship, Dinh Cau has been well-known for its supernatural power. Dinh Cau, also called Long Vuong Shrine, is situated at Quarter 2 Duong Dong town. From the town center, go down 30 April street to the vest, then turn left into Bach Dang street for about 200 meters and there comes Dinh Cau, Following the gently-sloping stone path with 29 steps, visotors will arrive at the shrine-one of the poetic sceneries in Phu Quoc, which was built very long time ago. Moving inside, visitors can adnire ancient architectural masterpieces in exclusive designs. The main entrance of the shirine is made pf wood and has three characters "Thach Son" temple on the dome. Its walls are built from cement, and on the roof are the "two dragons fighting for pearls". In the sanctum, there are the worshipping table of princess Chua there are the Worshipping table of Princess Chua Ngoc, the statuss of two uncles, an incense-burner, lamps and drums... Festivals are help here every year on the 15th and 16th of lunar October, attracting flocks of local residents and visitors. The frontage of Dinh Cau looks towards the wide sea; on its right lies the white fine sand bank with rows of cocount trees whose spreading leaves are whisting in the wind; and on the right the busy port. Setting foot here, visitors can take pleasure in this inforgettable scenery i.e. The Sunset on the sea-an amazing picture that very few beaches can possess.